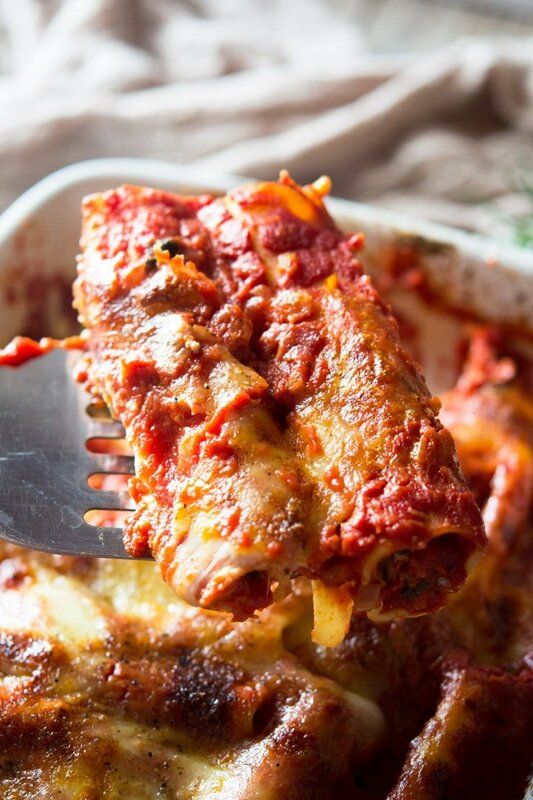 Like other classic Italian recipes such as lasagne and beef ragu, spinach and ricotta cannelloni is one of those recipes I will always go back to. It’s classic, comforting and surprisingly simple to make! Since living in Italy I have seen so many cannelloni recipes. A more rustic and traditional way of making them is with fresh lasagna sheets (homemade). Dollop some of your filling, be it spinach and ricotta or ragu and roll it up to create the cannelloni. The other option is to use pre-made cannelloni pasta tubes. I love using these because they are so easy to fill and ensure each tube is evenly filled, that way everyone gets an even portion. You should be able to buy cannelloni pasta tubes in most supermarkets, they’re pretty common and they save so much time. Tip: Use a piping bag or cut the corner off of a disposable freezer bag to fill your cannelloni easily. Finely chop a shallot and garlic and saute in a pan with a little olive oil for 1-2 minutes. Add the tomato passata (pureed tomatoes) with some torn basil leaves, salt and pepper and simmer for around 5 minutes, set aside (photos 1 & 2). Tip: Making a simple tomato sauce with shallot, garlic and basil will give this spinach and ricotta cannelloni an extra punch of flavour and it’s so worth the extra 5 minute effort. Add some washed raw, fresh spianch to a large pan and wilt on a medium heat. Tip: Add a splash of water (around 1 tbsp) to stop the spinach from burning and to help wilt it all. Leave to cool and then squeeze out as much water as possible (photos 3&4). 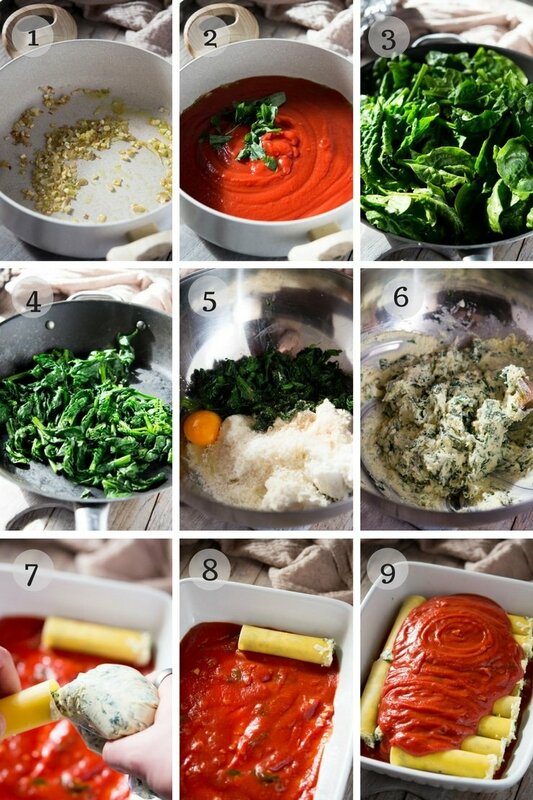 To make the spinach and ricotta filling, add the ricotta, parmesan, chopped spinach, egg, nutmeg and salt and pepper to a large mixing bowl and mix everything together until creamy and thoroughly combined (photos 5&6). 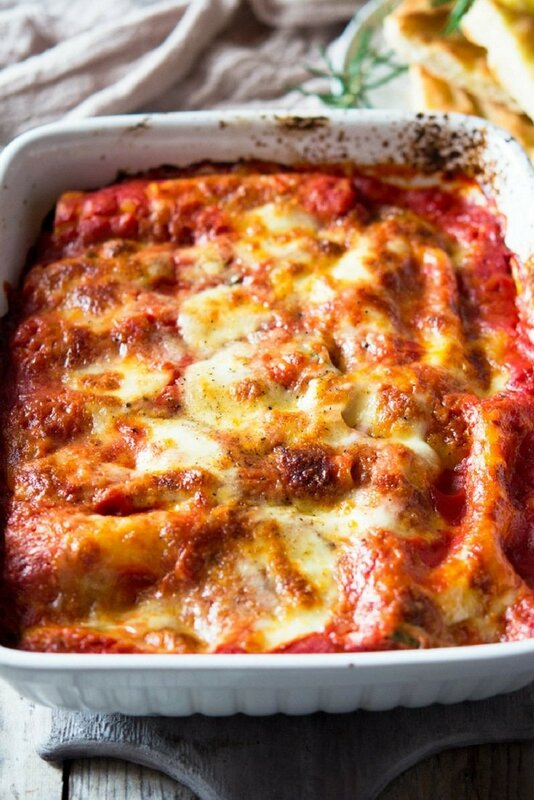 To assemble the spinach and ricotta cannelloni, add a few spoonfuls of tomato sauce to the bottom of a large baking dish. Transfer the spinach and ricotta filling to a piping bag or a disposable freezer bag with the corner cut off and pipe the filling into the cannelloni pasta tubes. Add each filled cannelloni tube in an even layer in the baking dish (photos 7-9). Top the cannelloni with the remaining tomato sauce then top with torn mozzarella and grated parmesan. Cover with tin foil and bake for 30 minutes then uncovered for 10 minutes or until the cheese is golden and bubbling. Tip: Make this in a disposable foil tray and freeze to make meal time throughout the week even easier. Enjoy a home cooked , delicious meal in a matter of minutes! Lentil ragu (vegetarian) replace the tomato sauce with bechamel as above. 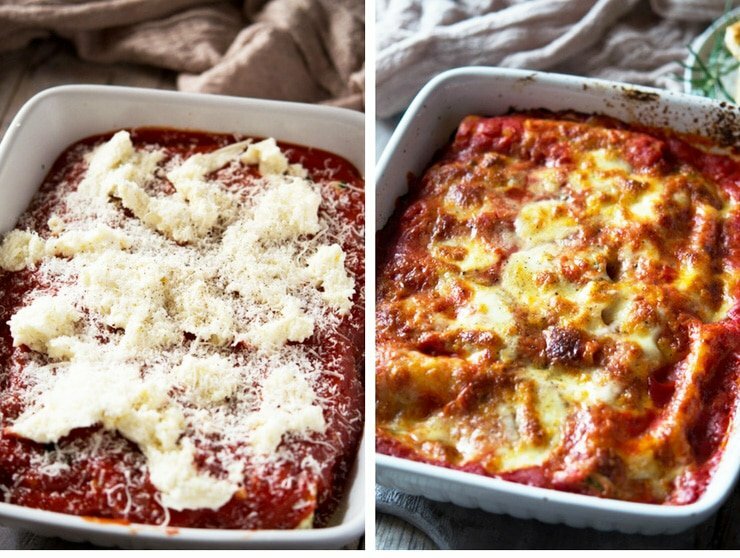 If you’ve tried this easy cannelloni recipe or any other recipe on the blog then don’t forget to rate the recipe and let me know how you got on in the comments below, I love hearing from you! You can also FOLLOW ME on FACEBOOK, TWITTER, INSTAGRAM and PINTEREST to see more delicious food and what I’m getting up to. Spinach and ricotta cannelloni made with a simple tomato, basil sauce and topped with melting mozzarella cheese. Finely chop the shallot and garlic and saute in a pan with a little olive oil for around 1-2 minutes until soft and translucent but not browned. Add the tomato passata (pureed tomatoes) with some torn basil leaves, salt and pepper and simmer for around 5 minutes, set aside. Add the washed raw, fresh spianch to a large pan and wilt on a medium heat. Add a splash of water (around 1 tbsp) to stop the spinach from burning and to help wilt it all. Leave to cool or rinse under cold water then squeeze out as much water as possible and finely chop. To make the spinach and ricotta filling, add the ricotta, parmesan, chopped spinach, egg, nutmeg and salt and pepper to a large mixing bowl and mix everything together until creamy and thoroughly combined. 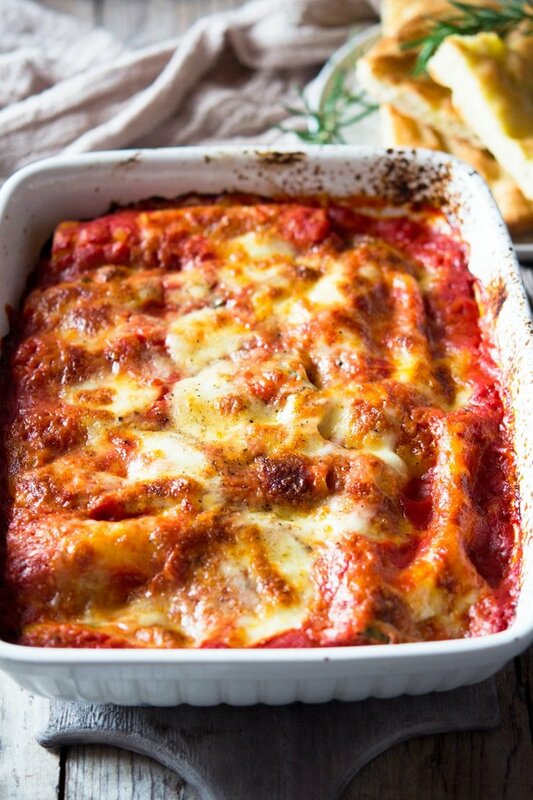 To assemble the spinach and ricotta cannelloni, add a few spoonfuls of tomato sauce to the bottom of a large baking dish. Transfer the spinach and ricotta filling to a piping bag or a disposable freezer bag with the corner cut off and pipe the filling into the cannelloni pasta tubes. Add each filled cannelloni tube in an even layer in the baking dish. Make as above in a foil disposable tray, cover and freeze. Thaw completely before baking in the oven. The flavours of this dish are simply amazing. I would give 6 stars if I could. A minor point but something I will try differently in future is to sprinkle grated mozzarella on top rather than torn mozzarella. I found the torn mozzarella did not melt evenly and I had to bake longer to let the cheese melt properly. So happy you enjoyed it and thank you so much for the lovely comment. That’s a great tip, you can definitely get an even coverage with grated mozzarella! Have a great weekend. I enjoyed making this but as a very amateur cook the twenty minutes preparation is way off the mark. The list of ingredients doesn’t include an egg so that was a surprise. Anyway, it’s in now so the proof of the pudding as they say…..
Hi Errol, oops sorry about the egg I’ve added that into the ingredients list now. I totally understand it may take longer to prep also so I’ve adjusted the timing to 35 minutes which should be more manageable for everyone. Hope you enjoyed it! This dish is sooo beautiful and I love how there are other fillings to try. I can have this all week every day!!! I think I could too, soo yummy. Thanks Tiffany! Ok so I’m devising a plan involving me moving to Italy so you can make me food ;P seriously though! I love how simple and delicious this meal is! Hahaaa that would be fun! Thanks so much Marlee! Aw thank you so much Amanda! Mmmm. I love that you put spinach in the filling! I love cannelloni and love how easy it is to make. Can you believe that I never thought of using a pastry bag to pipe the filling in the pasta tubes? DOH! Great tip! I can’t wait to try your recipe! It looks both delicious and pretty! Thanks so much Elaine, hope you enjoy! I love cannelloni and now that I know how that ricotta is lower fat, it’s my favourite with pasta. Can’t wait to try your version! 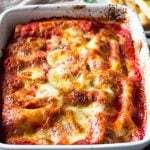 I love cannelloni and even if I make my own pasta I like to use the cannelloni already made. It is so much easier. This is a nice recipe, I never tried with tomato sauce, I usually make them white. I should try next time which might be tomorrow. They are so much easier, aren’t they? Thanks Laura! That golden melty cheese is everything. I want to dive in! this is making me drool so much! Perfect classic, ideal cosy meal for any day of the week! The step by step instructions are perfect!! This is one of my favorite Italian dishes.! Thanks so much Pam, it’s sooo good! I love how bubbly the cheese is in your pics and I love the other stuffing options you give — looking forward to the Tuscan sausage ragu! Thanks Alysas, that’s such a great filling with bechamel sauce on top, yum! Canneloni is an amazing classic comfort food. Thanks for the step by step pix, you’ve made it look easy! Thanks Kate, it really is so simple to put together!